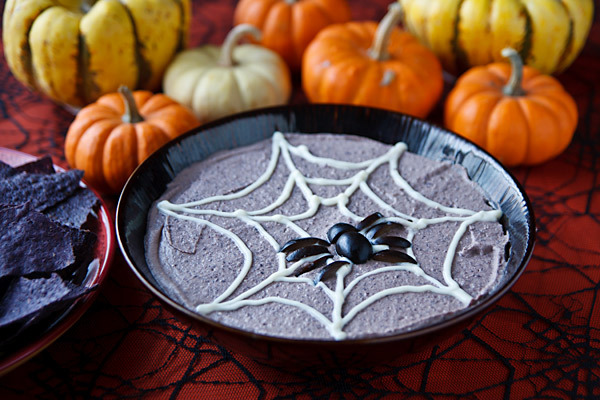 This spooky black bean hummus, complete with edible spider web and spider, will be the healthiest thing on your vegan Halloween menu. I have two standard Halloween recipes in my, ahhem, repertoire. One of them involves baking the equivalent of a 4-layer chocolate cake in the shape of a pumpkin; it contains a gazillion calories and takes most of an afternoon to make. As you can probably guess, I don’t make that one very often. 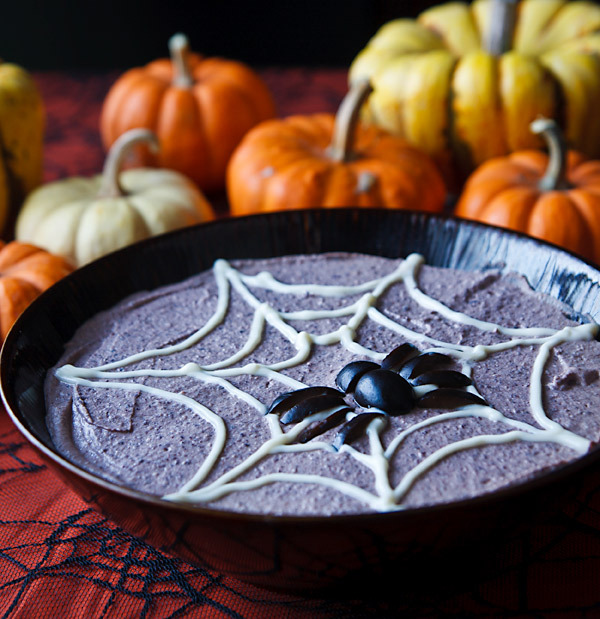 When I need a Halloween-themed food for a party, I’m much more likely to whip up this black bean hummus dip, which takes about 10 minutes and, if you scoop it up with carrot sticks or rice crackers, is one of the lighter dishes you’ll find at most parties. I vary the ingredients every time I make it. Sometimes I treat it as a regular hummus, with lemon juice and a pinch of paprika; other times it’s more of a Southwestern bean dip, with chili powder and even tomatoes. I took the middle road this time and used lime juice instead of lemon and chipotle pepper instead of paprika. Unfortunately, I went a little overboard and added too much chipotle, resulting in a dip that was overly smoky and too spicy to serve to unsuspecting party-goers. To balance out the heat and smokiness I started adding soy yogurt by the tablespoon. As it turns out, I like the creaminess the yogurt imparts, so I’m leaving it in the recipe. My advice is to add the chipotle a little at a time; if you add too much, its smoky flavor borders on bitter. Did you know I have at least 20 hummus-type recipes? You can find them all, including my Halloween-themed Killer Jalapeño Hummus, in my Hummus Recipes archive. With food processor running, drop in the garlic cloves and process until finely chopped. Add the black beans, and process until pureed. Add the remaining ingredients (use the lesser amounts) and process until smooth. Taste and correct seasonings, adding more as needed. Spoon the hummus into a serving dish, smoothing the top. Using a pastry bag and either soy yogurt or thinned tahini, pipe on the design. Place a plastic spider into the web, or make one yourself from black olives. Refrigerate until ready to serve. I’ve been visiting your blog for over a year now and have yet to comment! I’m a great fan of all your recipes, of which many, I have tried! 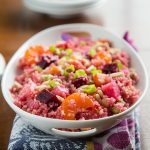 I have to say, every meal I have tried to recreate has been truly delicious! I’ve been a vegan for around 18months now – having been vegetarian for 7 years before that (since I was 9 to be precise). 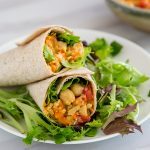 I have a passion for vegan cooking and your recipes are consistently inspiring me to be that much more creative myself! I don’t think I can recall the number of occasions I have walked to the table with a vegan dish (most often one of your recipes) and for all my family and/or friends – who, let me point out,are all meat-eaters – all gaze at my plate salivating, despite having their plate of animal flesh, which supposedly is the ‘only good thing to eat’ on the planet! Usually on these occasions, none of them will attempt to start a heated debate with me about my lifestyle choices, as I think they often know I could win the argument hands down. Though, it is often a featuring topic during meal times with my family! I was really hoping you would post a Halloween-styled recipe this year! 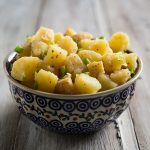 I have been eager to produce something relative to the occasion and this looks to be another truly brilliant recipe! I’ll no doubt be rummaging the cupboards tomorrow (should probably mention I live in the UK, so it has just gone 11:45pm here) to see whether we have any black beans to hand! I would have never thought of making a black bean houmous, but it sounds great! This is rather random, but for certain earlier recipes that I have wanted to try, one of the ingredients is ‘liquid smoke’ – I just wondered what exactly it was and if there was a substitute for it as I do not think I have ever seen such an ingredient over here. Anyway, I apologise for this rather long comment! It is my first, despite being a regular visitor to the site, but will no doubt endeavour to comment more regularly on future posts! Oooh, yum!! Love the presentation too (minus the spider though, since I have an INTENSE case of arachnophobia, haha). What a creative soul you are, Susan! I have never made hummus with black beans before. This sounds and looks delicious! I love the spiderweb on top, it gives it a spooky touch. I love your spider! and recipe! I have been craving hummus lately! I need to try black bean hummus again. The first time I tried it was a recipe that I just wasn’t into but I think I’d like a more basic style. That looks too cute to eat! Love the presentation! 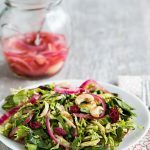 I am definitely bookmarking this recipe! It looks so halloweeny and the colors are great. I’ve got two cans of black beans dying to become hummus. I love the olive spider! That is the prettiest bowl of hummus that I have ever seen! Well done on creating a healthy Halloween treat! I love it, so simple and Halloweenie! Thank you for this. I love the look of your hummus, perfect for halloween. I love how gray it is. That looks fantastic. I’m going to a Halloween potluck in a few days, and I can’t wait to try this. Thank you! Thanks, Susan- I am having a Fright NIght with my flatmates on Thursday and was racking my brains for something snacky to contribute. What will be have to do to get you to post the cake recipe for us ambitious individuals? And in response to Matt’s post above- I am also living in London (he can feel free to contact me with any questions on available vegan options)- and liquid smoke is definitely on shelves at Fresh n’ Wild in Soho or Camden. I also know that my local Sainsbury’s carries canned black beans. I was trying to post back to Matt (see above), but could not figure out how to send him a separate comment! Liquid smoke, or smoke condensates, are produced through the controlled burning of wood chips or sawdust. The resulting smoke is passed through water, which captures and dissolves the smoke-flavored components in solution. This base can be condensed and modified through many methods to develop a wide range of smoke flavors. So it is Vegan, but not necessarily good for your long term health! As chilpotle peppers are basically smoked jalapeno peppers, I would leanb towards a more robust, less-smokey chile powder. A medium-heat, ground-dried New Mexican, Californian,Arizonan or Hungarian could be substituted. Just in time for my book club carry-in dinner this Thursday! This will look great paired alongside my green jalapeno pepper “witch’s goo” that I planned to take. I have tofutti sour cream to substitute for the soy yogurt and a touch of chipotle in adobo sauce for the chipotle powder. Thanks for a great Halloween-themed recipe Susan! wow- sooo cute!! and love that it is healthy, instead of chocolate/candy! i love this idea! and the spider and web on top are just too cute! Really, really cool! I love the idea and will be making it for Friday dinner/snacks before we go out trick or treating! what a perfect spider web. Wonderful presentation! looks great! like other readers, i think i need to give black bean hummus another go! Ooooh… I’ve been itchin’ for a black bean hummus and didn’t even know it! I LOVE everything black beans! Thanks again 😀 Very cute presentation! It would be so cute alongside your carrot hummus, too…perfect halloween colors! I love it! So festive and scary looking, especially with that spider 😉 Well done! this is so nice specially for the holloween season. thank you for sharing us your ideas! this looks soooo good, I wish I had time to make this before our work pot-luck today. Oh well, adding to the list of must try recipes. Thanks! Okay, that looks awesome. 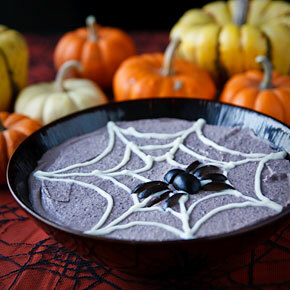 Black bean hummus sounds great and I love the spiderweb! I used a can of black beans,a lime, added a big roasted red pepper from a jar, and a couple of spoonfuls of “sour cream”…as usual for me…heavy on the chipotle and cumin…this is possibly the best dip I’ve ever made! Thanks! I tend to use pimenton instead of liquid smoke. I like in the UK at the moment and I can't find it here as easily as I can in the US. Plus pimenton doesn't have that slightly worrying back story regarding its production. It's so funny that you posted this. I just made it last Sunday for a kids' Halloween party we were having! It was a big hit! Thanks so much for the great recipe. 😀 We ate it with blue corn tortilla chips to keep with the "dark food" thing, and because tortilla chips go so good with black beans! And chopped veggies, of course. Mmmm. I will definitely have this again, spiderweb or not. Oh my gosh this is genius!!! thank you for the idea! You make me want to throw a Halloween party!! I absolutely LOVE the spider web 🙂 PS: your blog is awwwesome! So many delish recipes. As we don’t eat soya, could you I substitute it with something else? The soy yogurt is optional, so you could just use the tahini. 2 cloves. Somehow it got left off of the non-printer version. Is there any way to make this dip without the tahini? I cannot have any oils. Sure, just leave it out. You can add more seasonings to taste if it tastes bland to you. I just made this for a second time. I didn’t have the yogurt, so I put in vegenaise. I used a little less than half lime juice (because I only had about 1 1/2 tbsp) and the rest lemon, reduced sodium beans, and a little extra sea salt to make up for that. It tasted great, but I decided at the last minute to throw in 4-5 drops of liquid smoke. And a handful of fresh chopped green onions stirred in at the last minute (not in the processor). OMG! What was already great is now AWESOME! is the spider artfully cut black olives?? Also, I thought you make all the hummuses in the vitamix? I reallyy want to know what model you have I may splurge at some spoint and get one on ebay. Yes, I made the spider out of black olives. I used the food processor for this hummus because I made it before I had a Vitamix. I have the 5200 model, the one that’s currently being sold on the Vitamix site, but I think they’re all great machines. You can even find older ones on eBay that a still in great shape. Why do you call it fat free when you add tahini? I have been loving homemade hummus lately! I love to overload the garlic! The flu/cold has been going around in my daughter’s school and I’ve been craving hummus! I added some raw sunflowers to the mix and love the nutty flavor. Plus, I think with all of the garlic, I’ve managed to keep the flu out of my system! I want to try the black bean variety since I love what the local restaurant does with the black beans in their burritos and taco salads. I’ve been trying to stay away from meats and the beans have helped me stay compliant. Love the flavor!! This looks delicious and I plan on making it tonight! Just a kind suggestion: when you put the serving size, can you also put the amount, like 2 TB or 1/4 c? I’m just not sure how much is 1 serving of 10. Thanks! I’m making it right now, so I’m going to chop of some of my frozen chipotles in adobe sauce & see how that works. Using the 1/8 to 1/4 tsp makes me think of something ground, but I’ve never found chipotle peppers as a ground spice. We just found your site and have a pile of recipes to try! Hi Jenn, you’re right that I meant chipotle powder. I’m lucky to be able to find it in the spice section of the local Kroger. But you can easily use chipotles in adobo sauce. How much depends on how spicy you want the hummus to be. Start by mincing up one of the chipotles and add it little by little to the hummus after the other ingredients are added. Some of those chipotles can be really fiery, so start off small! It worked wonderfully! I used about half of a chipotle. I actually threw it in with the garlic at the beginning since it was frozen and I wanted it chopped up well. We like things spicy and I could have used a bit more, but it is delicious! Thanks so much!!! I found the perfect Vegan wine to pair with the Halloween’s sweets -the Deccolio Prosecco, I bought it in Whole Foods Market (it’s in their top 10)!! Happy Halloween! I love your plating and food design.